ADOBE ACROBAT READER software to be installed on your computer. How to change colour in your image. This tutorial will show you how to change a colour in your image using Photoshop CC (2017). You will learn the basics of making a selection of your colour to replace and then changing to any colour you choose. In this tutorial I will show you how I changed the bland original roof colour of this Isle of Harris hut to the more traditional rusty red colour. This tutorial will show you how to use the Google/Nik Collection Color Efex Pro4 Filter called DETAIL EXTRACTOR in Photoshop CC. The Tutorial will also show you how to apply DETAIL EXTRACTOR in a controlled way using a Layer Mask in Photoshop CC. This tutorial will show you how to fine tune your image for printing. This tutorial will show you how apply a Graduated filter in Adobe Camera Raw. This tutorial will show you how merge a set of Raw File images opened in Adobe Camera Raw to HDR in Photoshop CC 2018. A new HDR Raw File will be created that can be further processd in Adobe Photoshop CC. This tutorial will show you how to crop then correct any no image areas. 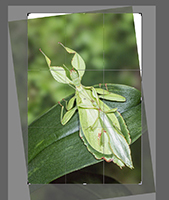 This tutorial will show you in simple steps how resize your image for projection. How to Use Multiple Levels Adjustment Layers to Lighten, Darken or Adjust the Contrast of an Image. 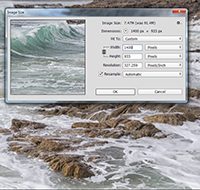 This method involves the creation of 3 separate LEVELS Adjustment layers. One layer to, darken the image, one layer to lighten the image and one layer to adjust the contrast of the image. The use of the layer mask that comes with the adjustment layer allows you to select which parts of the image you want to adjust. You can see the effect of the adjustment as you go along. This tutorial will show you how tone your image using one extra layer and a blending mode. This tutorial will show you how apply a graduated neutral density effect on an image where you should have used a graduated neutral density filter to correct the exposure for the sky at the time of taking the image. How to Split-Tone a B&W Image. This tutorial will show you how you can split-tone a B&W image. Two Adjustment layers are used for this so that you can re-visit the image and change the split-toning any time you wish. This tutorial will show you how you can quickly tone a B&W image. An Adjustment layer is used for this so that you can re-visit the image and change the toning any time you wish. This tutorial will show you how to convert your colour images to Black & White using RGB Channel mixer and then to modify the tones within the image. This method will give you control over the whole tonal range of your image. This tutorial will show you how to simulate the Darkroom technique of Enlarger Diffision on negatives, by selectively blurring the black tones in your image. This technique can be used to enhance your Infra-Red images. We have all taken images where the horizon is tilted. This tutorial shows you how to correct them with ease. This method of sharpening is done using the HIGH PASS FILTER and doesn't give the obvious haloes that unsharp mask does. In this tutorial I show that the dodge and burn tools don't do this, they actually make the image whiter or blacker. I will then show you how to dodge and burn to make the image lighter or darker, which is a much better method. 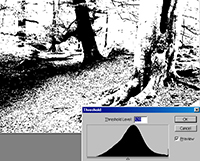 This tutorial will show you how to selectively apply filter effects to an image. This tutorial will show you how to find the lightest and darkest parts of your image and how to set them as the white point and the black point. This technique is primarily intended for extending the tonal range in a low contrast image. If a known white or black is targeted in an image, it will remove the colour cast in those tones. A COMPARISON OF METHODS USED TO CONVERT COLOUR IMAGES TO B&W. This tutorial will show you some of the different methods that are used to convert colour images to Black & White and shows the advantages and disadvantages of each method. For some years now, since the Digital Photography revolution began, photographers have been recommended to use Adobe RGB (1998) as their working color space. Photographic technology has moved forward at an alarming rate and given us better cameras, monitors, printers and software. Is it now the time to change to ProPhoto RGB? If you mention that you have seen this advert on Derek Doar's website, Lehmanns Ltd will give you 10% discount on any of their services.